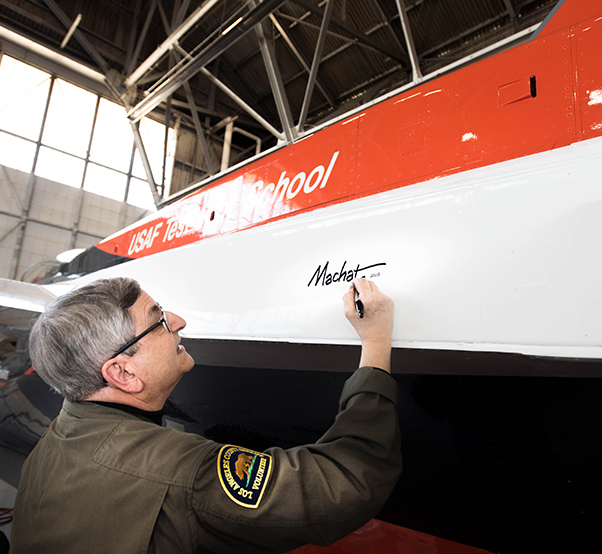 Renowned aviation artist Mike Machat officially endorsed his latest work for the U.S. Air Force Test Pilot School March 7 when he applied his signature to the school’s NF-16D VISTA in-flight simulator. The VISTA is sporting a new paint scheme designed by Machat. The one-of-a-kind aircraft is a staple of the school. VISTA is an acronym that stands for Variable stability In-flight Simulator Test Aircraft. The modified F-16 can be configured to fly like almost any aircraft type. 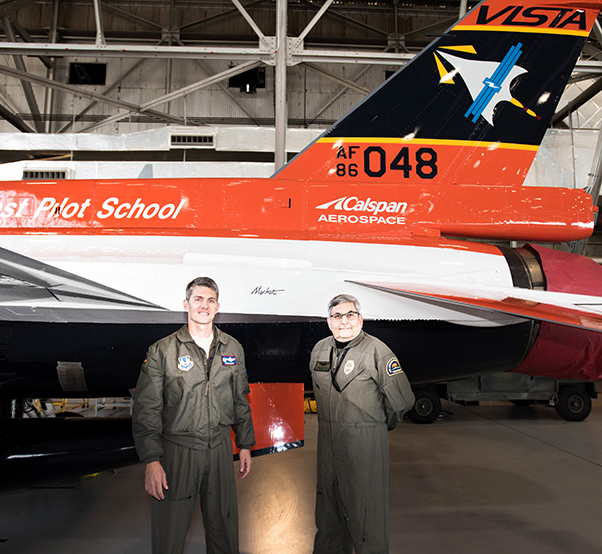 Col. Ryan Blake, U.S. Air Force Test Pilot School commandant (left), poses for a photo with aviation artist Mike Machat in front of the school’s NF-16D VISTA in-flight simulator March 7. The VISTA is sporting a new paint scheme designed by Machat. Vanhoy said “naturally” he reached out to the long-time friend of TPS, Machat. 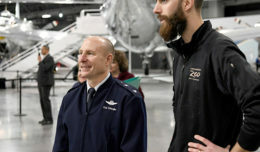 In past interviews, Machat said he’s honored to have produced nearly 30 Edwards-related artworks since 1978, including the “Golden Age of Flight Test” mural at the Air Force Flight Test Museum and the 50th Anniversary painting of the Bell X-1’s first supersonic flight. 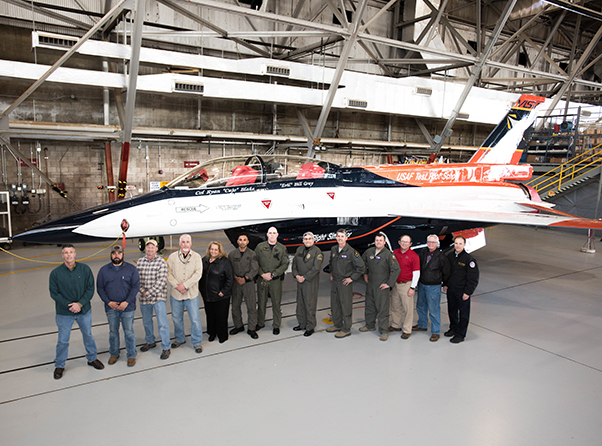 Machat also completed the 70th Anniversary commemorative painting for the U.S. Air Force Test Pilot School. 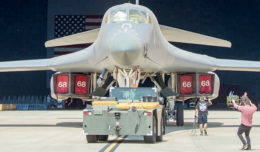 He’s contributed dozens of paintings to the U.S. Air Force Documentary Art Program and currently has eight paintings on display in the Pentagon. 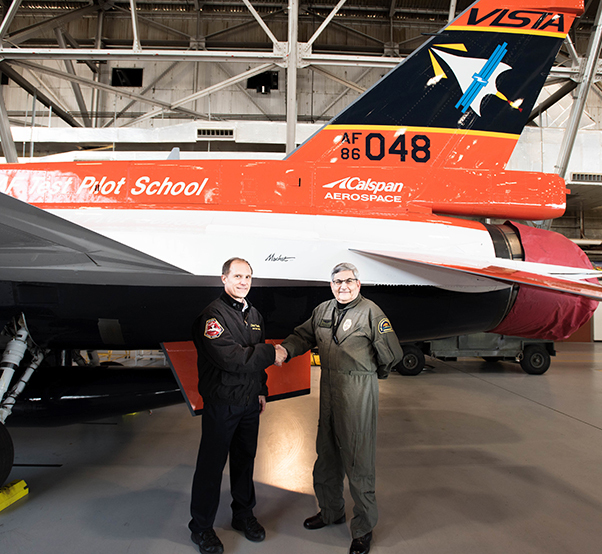 He’s also produced two paintings for NASA and has four paintings in the permanent collection of the Smithsonian National Air and Space Museum in Washington, D.C.
David Vanhoy, U.S. Air Force Test Pilot School technical director (left), poses for a photo with aviation artist Mike Machat in front of the school’s NF-16D VISTA in-flight simulator March 7. The VISTA is sporting a new paint scheme designed by Machat. Members of the U.S. Air Force Test Pilot School and aircraft maintainers pose for a photo in front of the school’s NF-16D VISTA in-flight simulator. The VISTA is sporting a new paint scheme designed by aviation artist Mike Machat. VISTA is an acronym that stands for Variable stability In-flight Simulator Test Aircraft. The modified F-16 can be configured to fly like almost any aircraft type.